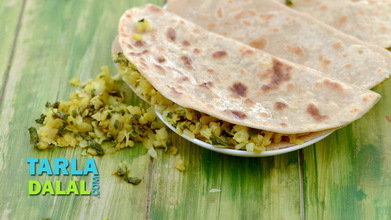 When you think of coconut and parathas, you immediately think of sweet versions. 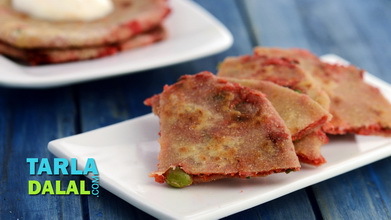 But, here is a unique Nariyal Chane ke Parathe that is sure to surprise you with its tongue-tickling, slightly spicy flavour. 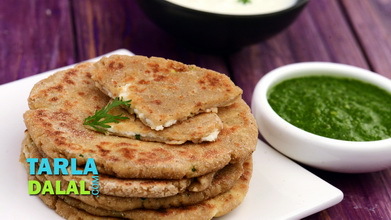 A combination of cooked white chickpeas and coconut is spiced up with varied spice powders and pastes, to create a flavourful filling for wholesome whole wheat parathe. 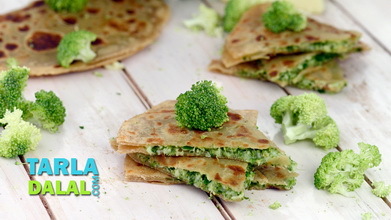 The mealy texture of the filling and its awesome flavour are sure to please your palate. 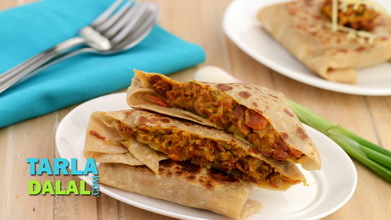 Just make sure you overcook the chickpeas a little, so that it will mesh well with the other ingredients, and you can roll the parathas easily. 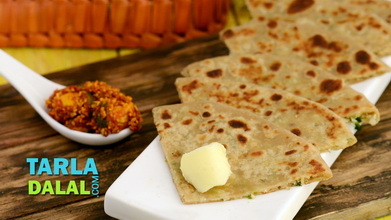 Enjoy this satiating Nariyal Chane ke Paratha with a cup of curds and your favourite pickle. When the seeds crackle, add the coconut and sauté on a medium flame for 1 minute. Add the ginger-garlic paste, turmeric powder, coriander-cumin seeds powder, chilli powder, chaat masala and sauté on a medium flame for a few seconds. Add the kabuli chana and salt, mix well and cook on a medium flame for 2 minutes, while mashing it lightly using a potato masher. Divide the filling into 6 equal portions and keep aside to cool completely. Combine all the ingredients in a deep bowl and knead into a soft dough using enough water. Keep aside. Divide the dough into 6 equal portion and keep aside. Place one portion of the filling in the center of the circle, bring together all the sides in the center and seal tightly. Roll out again into a 150 mm. (6") diameter circle, using a little whole wheat flour for rolling. 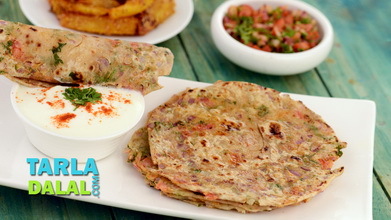 Heat a non-stick tava (griddle) and cook the paratha, using a little oil, till golden brown spots appear on both the sides. 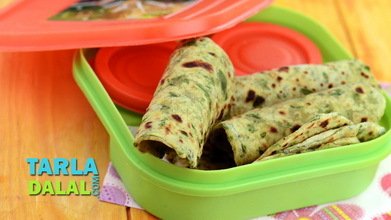 Repeat steps 1 to 5 to make 5 more parathas. Serve hot with fresh curds or pickle.